“My musical passion came into fruition when I was around 10 after hearing WALTER CARLOS. This then led to RICK WAKEMAN then inevitably YES, then GENESIS. Prog was then in my veins. I wanted to learn keyboards but couldn’t afford ’em, so bought a guitar. Many, many years later, after watching ANDY REVELL and TWELFTH NIGHT, I formed GALAHAD. So bizarre (and an honour) to end up playing with TN after all these years. GALAHAD are still going strong. 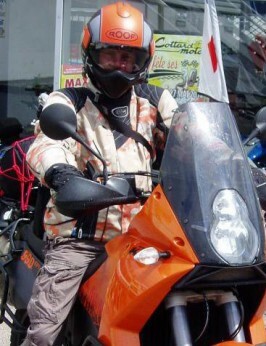 Motorcycling (I have a KTM ADVENTURE which is the best build quality and fun machine I’ve had to date)!! In addition, I enjoy model making, airbrushing, model railways, abstract art and recently got into rc helicopters. I’ve also learnt to water-ski, wakeboard, kneeboard, kite-surf, windsurf and dinghy sail. I don’t have a television. The most important thing to me..?